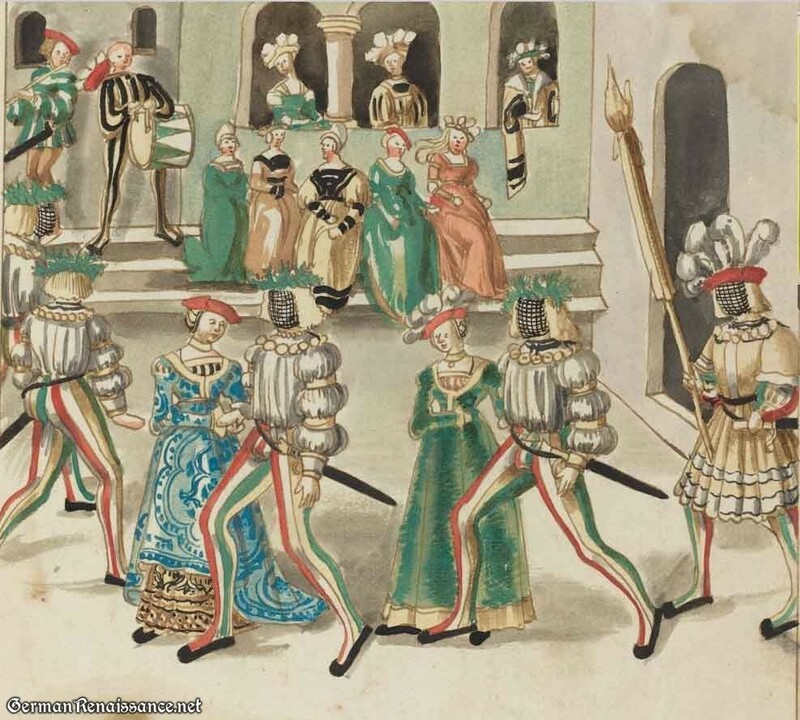 « Did the Christmas Tree originate in Renaissance Germany? 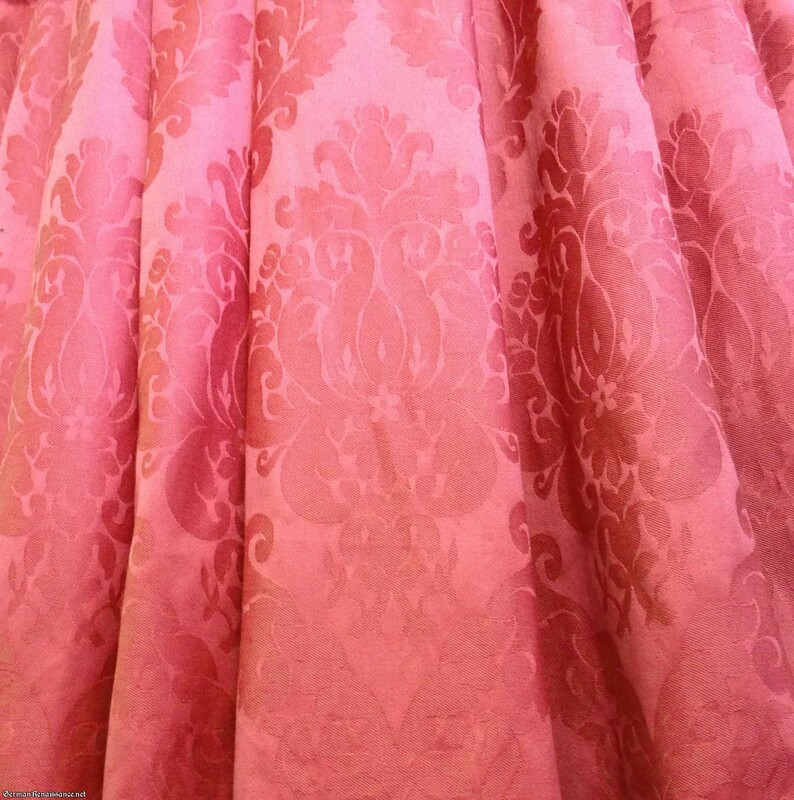 Several years ago I purchased 8 yards of beautiful pink damask fabric in 100% cotton. On a separate fabric buying trip, I found a lovely shade of brown velveteen, also 100% cotton. I held onto both, waiting for just the right way to use these yummy fabrics. 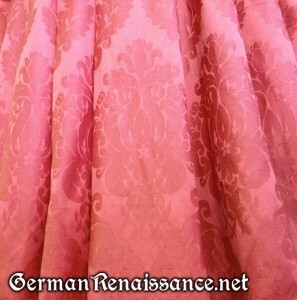 Little did I know I’d wake up one morning with the bright idea to use the pink damask and brown velveteen TOGETHER to make a style of German dress I’d yet to try. The result was delicious! 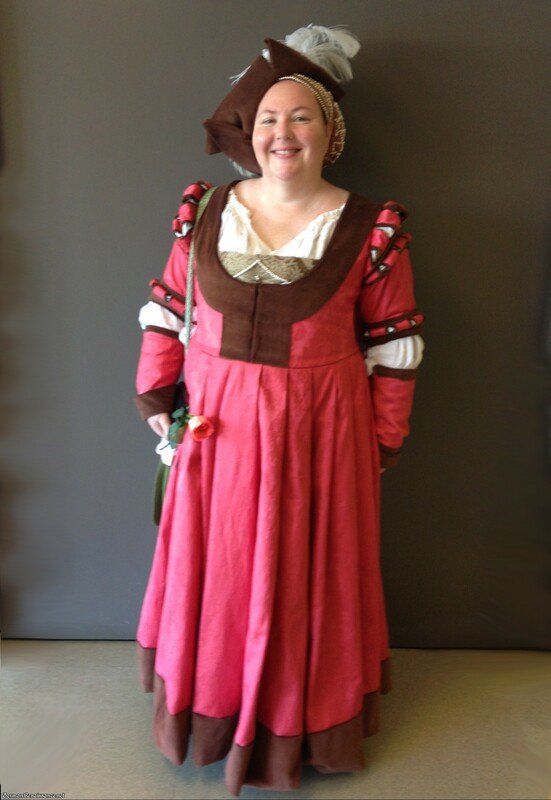 Gregor calls it my chocolate-covered strawberry gown. 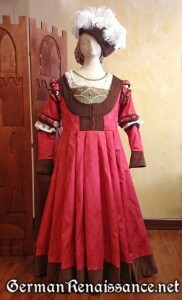 The pattern for my pink and brown damask dress was adapted from my tried and true Dorothea Meyer gown (see pattern), with modified straps that came further in (closer to the neck) and a lowered dekollete neckline. I brought the straps in closer because the gown doesn’t appear to sit off the shoulder, as many of the other German gowns of this time period do, and the slashed sleeve cap is quite high up on the arm. 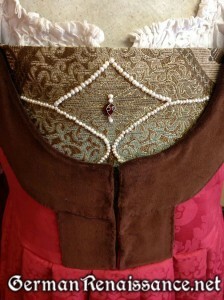 The bodice is three layers — damask, cotton canvas, and linen lining — which are flatlined together to give a smooth, stable shape. The skirt is the same rectangular construction with 24 rolled pleats which follow the pattern in the damask (I actually tried 48 pleats first, but it did not look right). 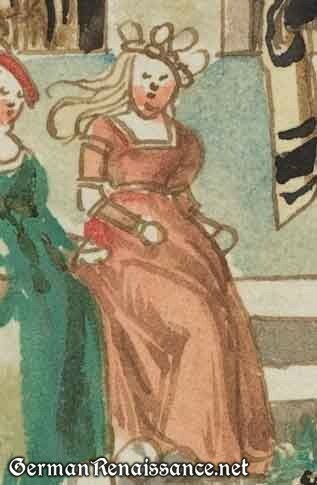 The brustfleck is a band of brocade that is wide enough to lie under the bodice, which keeps it in place without the need for pins (though pins help to keep it from sliding down into the bodice over time). 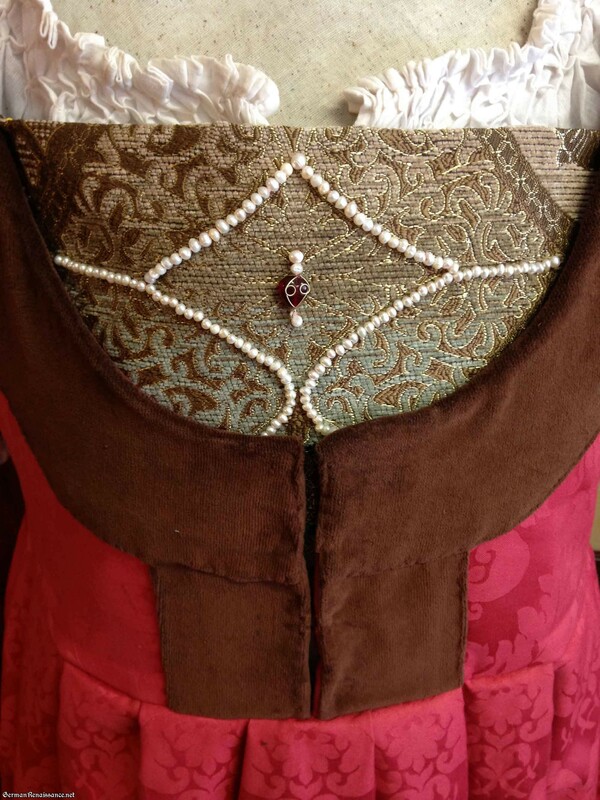 It is lined with white linen and has real pearls sewn on it — but I think it could use more pearls! I had a problem finding good, round pearls in consistent sizes, which made it heard to apply them in neat lines and curves (see my tutorial on applying them smoothly). The little red heart-shaped gem sewn in the middle of it was a token left for me at an arts and sciences display — thank you to whomever gave it to me! 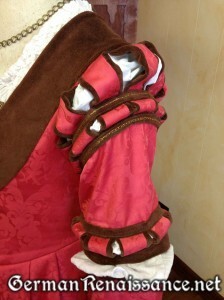 The sleeves have paning at the top and the elbow, with a separate foresleeve and a velvet conical cuff. I’m writing up a tutorial on how to make paned sleeves in the manner I do, so watch for that! The hat is made from the same brown velveteen. 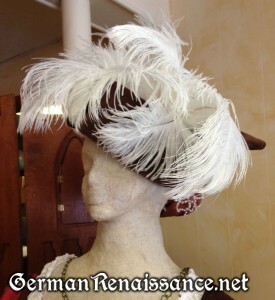 It’s essentially a large cap with a wide, two piece brim that is put up, sewn in place, and slashed a couple of times. 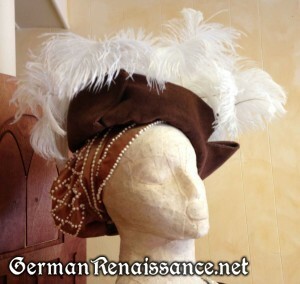 I’m happy to go into more detail on the hat if anyone wants to know how I made it. The feathers are curled ostrich feathers — there are about a dozen, but I think it could use a dozen more. 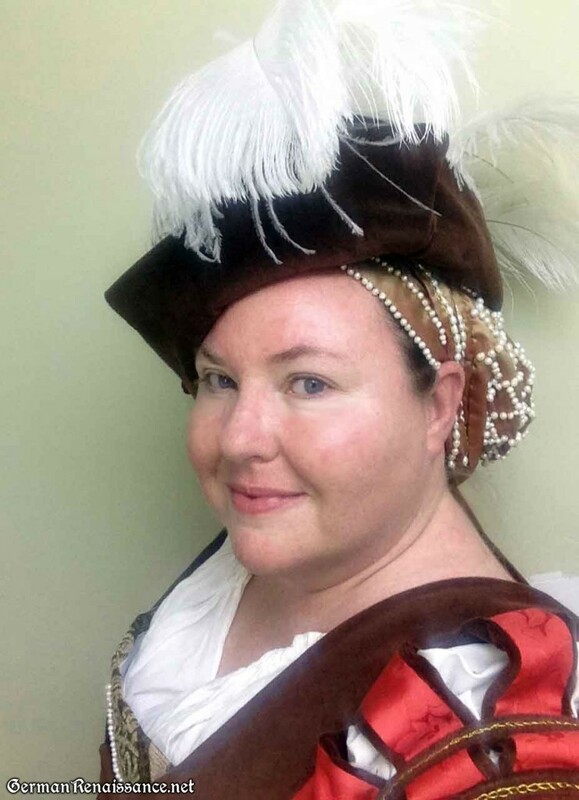 The cap underneath is my pearl and silk goldhaube that I made last year — this was my first opportunity to wear it with an appropriate style of gown. I treat my gowns as unfinished works because I enjoy adding on to them later. Things I’d like to here include adding another brown velvet guard to the bottom of the skirt, making fancier foresleeves with paning, adding more pearls to the brustfleck, and more feathers to the hat. 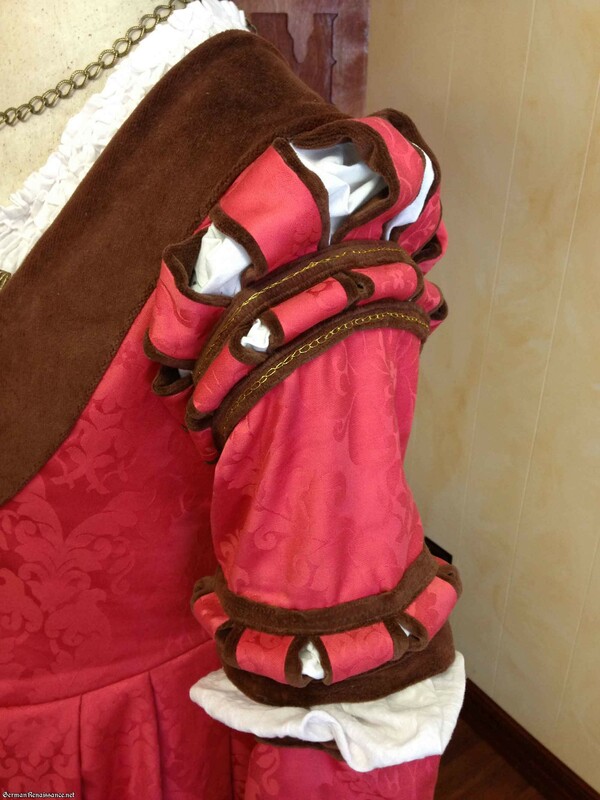 I also have some fixes: more hooks and eyes on the front of the bodice, shorter/tighter foresleeves (they kept wanting to slide down my arm even with a small tie at the elbow), and a repair to hem. Additionally, I think the velvet guard needs some training as it doesn’t like to curve along with the fabric — the velvet is actually pretty thick and heavy. Oh, and I need a fancy gold belt — Gregor is going to help with that. How historically accurate is it? As accurate as I can get based on my interpretations of available data, the modern fabrics (the damask and velvet would have been silk, not cotton), and that some seams were machine sewn (though there’s still a fair amount of hand sewing, too). 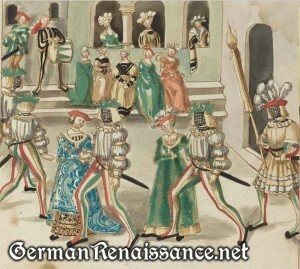 If anyone has questions or just wants to chat about the style, time period, fabrics, or anything, please leave a message or get in tough with me — I love to talk German! Very beautiful! and the dress also. 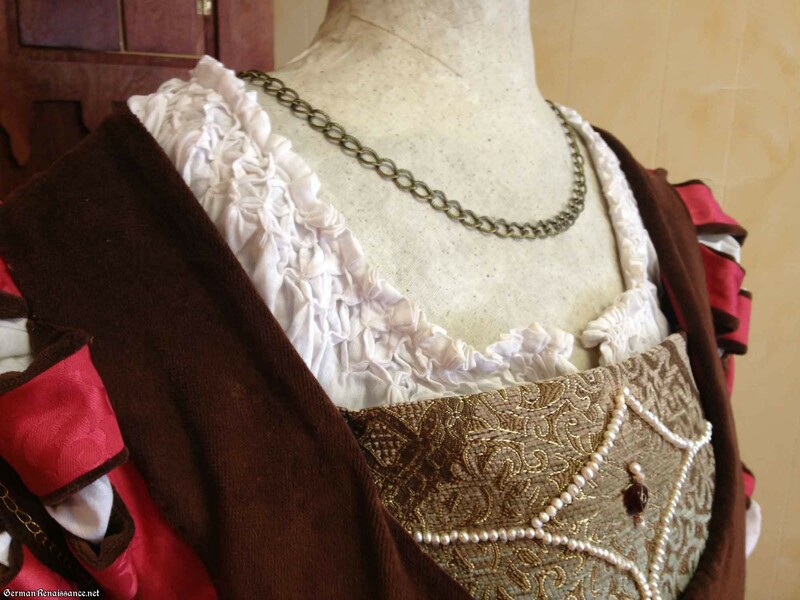 The only thing I would add, other than your own suggestions, would be some gold threads to the smocking along with several gold chain necklaces in varing sizes. I very much enjoy your blogs. This is so wonderful! Each dress just gets better and better! The pink really brings out your coloring! I knew that this dress would be nice from the prelim. pics., but this is better than expected. 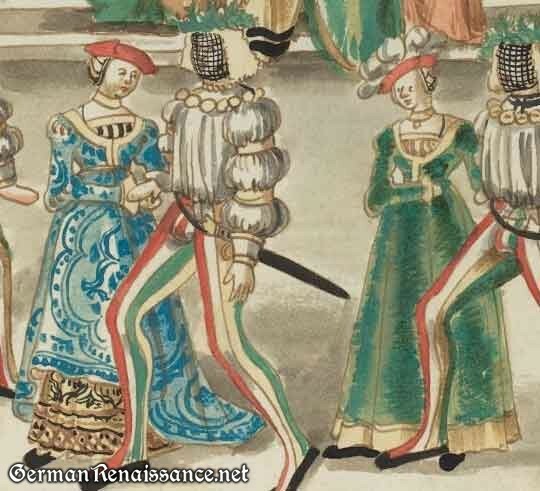 I am never done with any of my own garb. I always think of ways to improve it after I wear it. You would think after 35 years of this I could do just one dress that is perfect from the get go. LOL! At Joann’s I found (in the jewelery section), the perfect chain. It was a series of chains (with the really large links)That are supposed to be a component piece. I took my little pliers took the pieces apart and made one long piece out of the three. Get two or three (your honey will want one too). My husband took one look at mine and ran off with it. A Viking at heart. LOL I should have known. Over the years he has been off with all of my good long chains with large links. Men got to love em! LOL!!! I really LOVE this dress and you look great in it too! Please tell me how you made the hat! I’ve been trying to figure it out and can’t get my head around it. 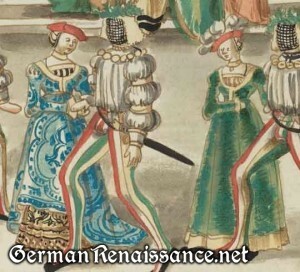 Also, for the red and black Cranach-style gown, where do you hide the opening in the skirt? Thanks! Any chance you could email me the hat photos? I was hoping to make it…well…tomorrow…to wear this weekend…I do everything last minute!